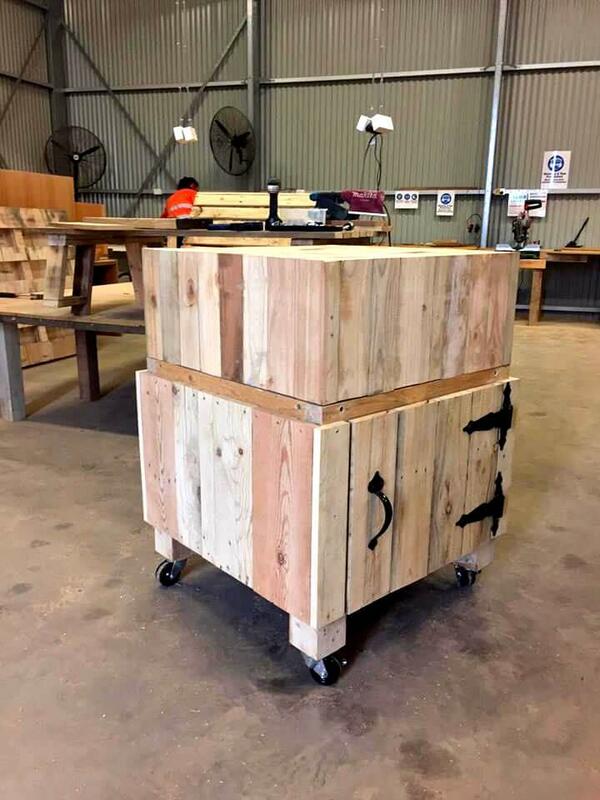 The pallet furniture craft we are to share here, speaks volumes for modern wooden creativity and is sure to put you in big amazement! 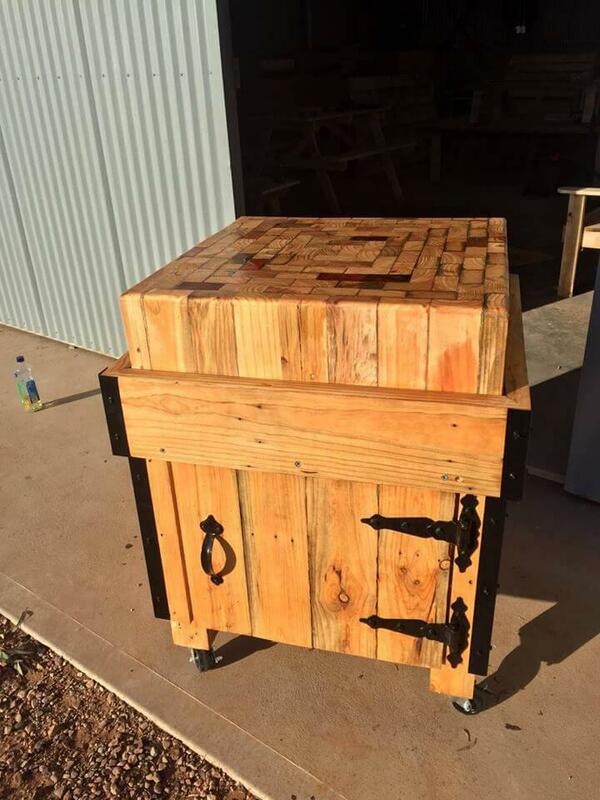 See this amazing DIY multipurpose pallet table with mosaic top, comes with a mini cabinet installed to bottom, makes it all friendly for various different types of storage! 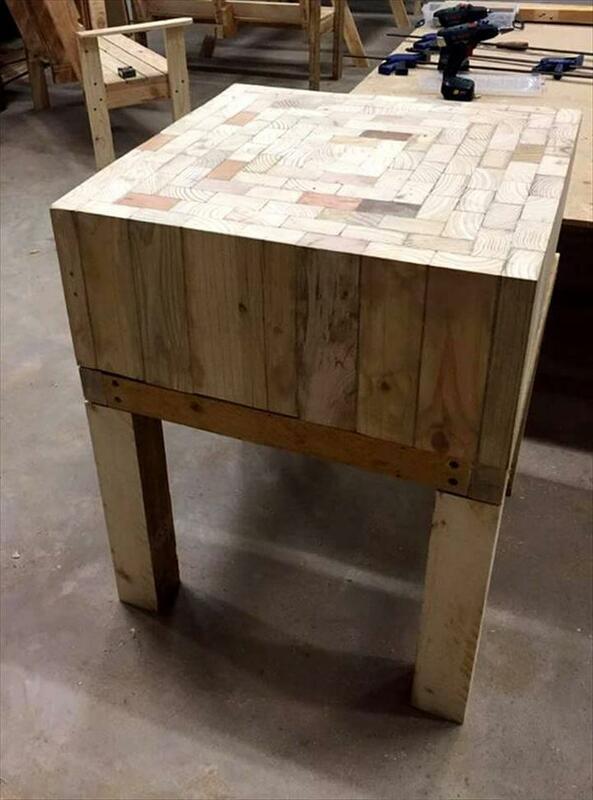 Amazing use of pallet scrap pieces has been made to gain a stylish mosaic table top that held interesting to all and also precious to all art loving eyes! Cabinet installed to lower portions, has a hinged door that is further having a metal handle for ease of opening, you can got some with amazing sparkling metal shades which can boost the visual impact of table more with their superior metal touch! Mosaic top makes it artful so it would be a center of attention in your living for sure! Table has been clear coated and can be finished in a custom way for amazing light or dark done of wood! 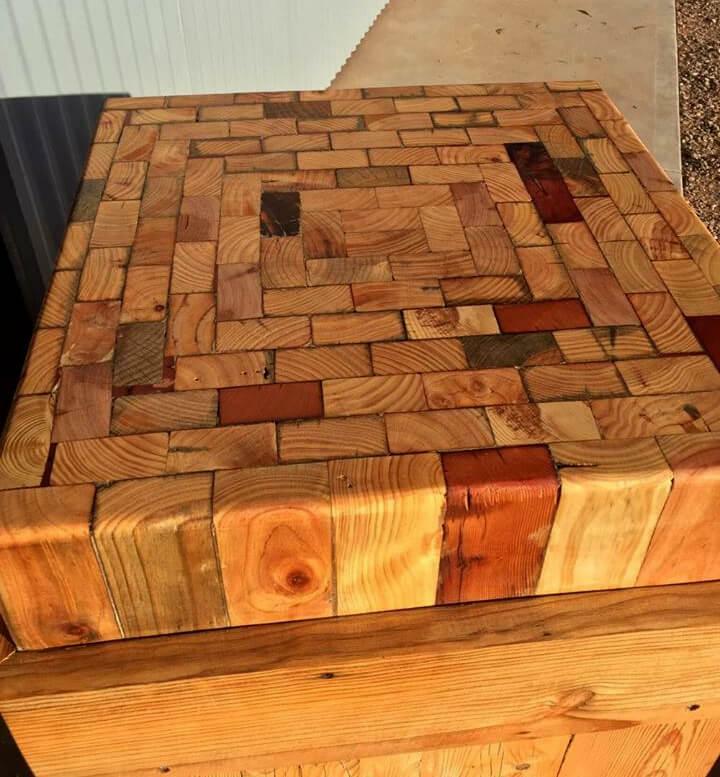 First of all build the mosaic top of the table by random but fine assortment of pallet scrap pieces, here scrap pieces have been gained into mini thicker wooden rectangles for a enchanting mosaic top! 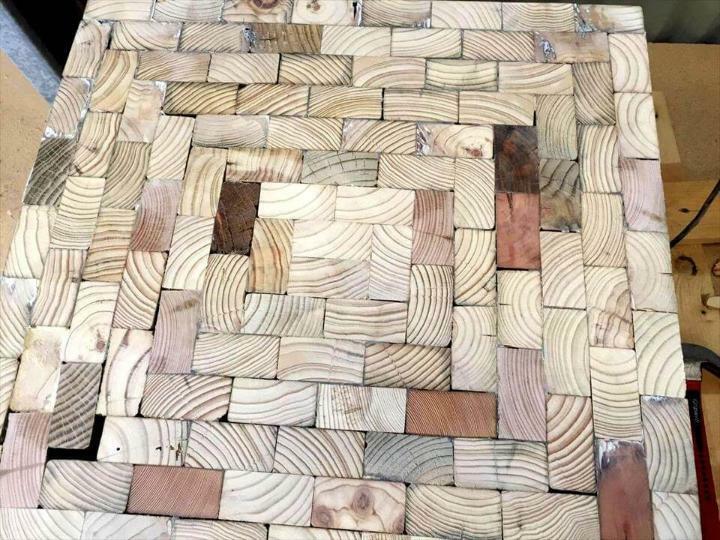 Here you can see the amazingly wooden chopped pieces inserted for a beautiful mosaic pattern, comes wth amazing lines for bigger impacts to beauty of the top! At the end the lower portion of table has also been covered for a storage-cabinet out of it and this is has also been done by sharpy resized slats of pallets! 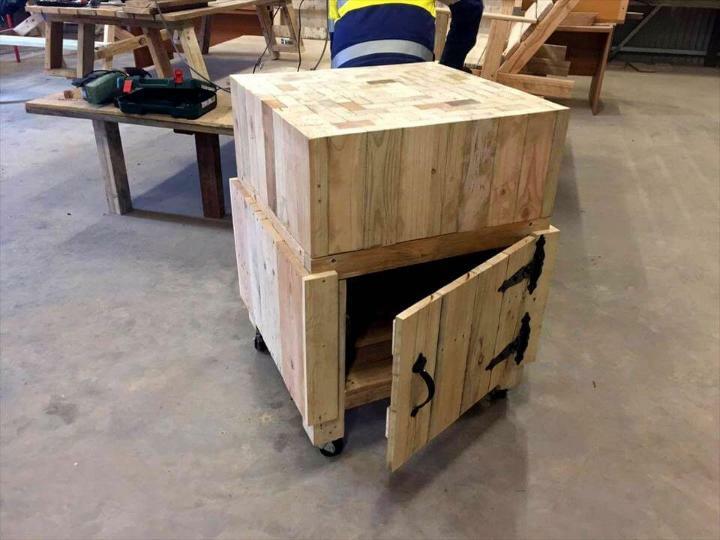 For a stimulating industrial air to whole wooden mosaic table, the metal hinges, a door handle and hardware caster wheels have been installed! That also make the table super easy to operate! Finaly clear coats make the wood grains more visible an hence the wooden surfaces gain a more vibrant look! Metal angle iron bars has been used for decorative edging of this unique multipurpose wooden table! You can also use the wooden corks for such a lovely mosaic table top, finally you can paint the table surfaces for a custom avatar of table also!